The company behind the Shewee female urination aid also makes a “pocket sized toilet,” the Peebol. It can be used by itself, or in conjunction with the She Wee, depending on your needs. How Does the Peebol Work? The Peebol is basically a bag with crystals in it. Once mixed with liquid, they trap odours and turn into a gel. Once opened, it can be resealed and then used again. Most people can get two uses out of it. Do I Need to Use the Shewee Along With It? If you’re a guy, it’s very easy to use the Peebol without a pee funnel of some kind. However, if you’re a lady, then you’ll probably need to use something like the Shewee as well. It’s basically a funnel or tube that you place under your urethra. When you pee into it, it directs the urine away from your body. Seriously, the sky is kind of the limit for situations when you might want to use a portable toilet like the Peebol. But, here are a few of the most common situations that we can think of. Do you have kids who get car sick? This thing is gold. They can throw up into it, and the crystals will activate, turning the vomit into a gel. Close up the bag and your car won’t stink. Plus, there’s nothing to clean up because you just have to throw away the bag at the next opportunity. Do you like camping? Then you’ll know that it rains sometimes. But, what do you do when you have to pee in the middle of the night and you don’t want to get wet and cold? You use the Peebol, preferable along with a pee funnel of some kind. Do you have to go on a long bus, car or train ride and have no access to a toilet? Combine this pocket sized toilet with a pee funnel and you’ll be good to go. Many rock climbers use a female urination device, but the problem is what to do with the urine. Do you pee freely down the rock face? That’s not so nice for the people who come behind you. One solution is to pee into a bag like the Peebol. Try it out and see if it works for you. 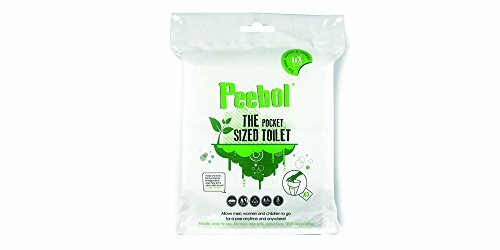 If you’re looking for a solution on how to pee when you don’t have access to a toilet, then the Peebol may be one of your best options. It’s a top-quality product that works well and is also reasonably priced for what you’re getting. We love that the crystals turn liquid into a gel. This makes it a lot easier to deal with, and far less prone to leaking. Not that you can turn it upside down, but if you lean the Peebol up against something, it’s not so likely to tip over and leak. Another reason to get this portable toilet is for car sick kids. It has a huge advantage in that you just have to throw it out, instead of having to clean something. What do you think about the Peebol? Leave a comment below and share your thoughts with us.